(L to R) Rev Timothy Eady, British Ambassador H.E. Brian Davidson, British Legion Chairman Andy Barraclough and Defence Attaché Colonel Roger Lewis defence attaché. 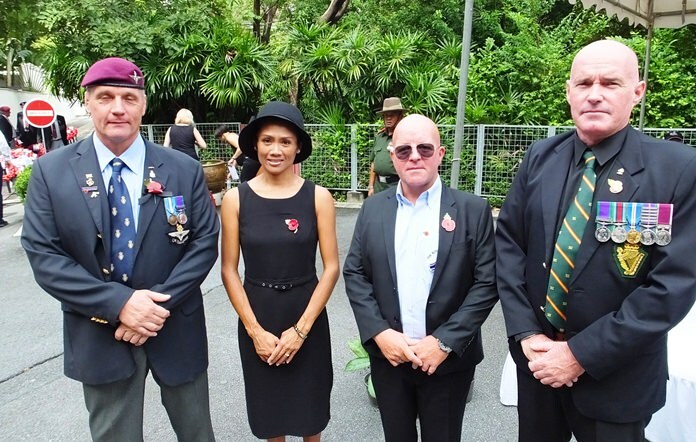 The Royal British Legion observed Remembrance Day at the war graves of Kan­chana­buri. Members of the RBL, Graham Macdonald, Andy Barra­clough, Rodney Charman, Bert Elson and more were present for the ceremony. The ceremony was attended by H.E. 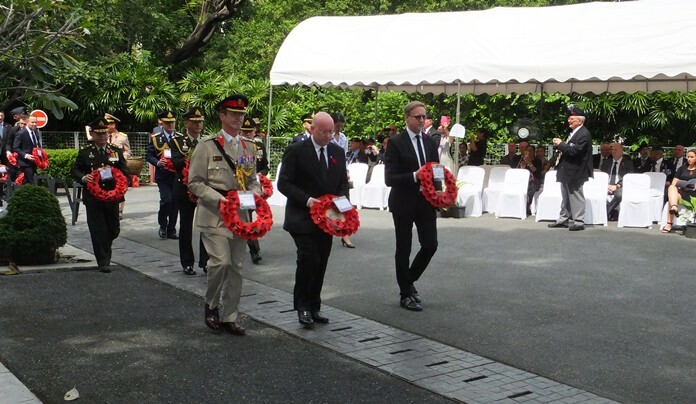 Brian Davidson, the Ambassador of the United Kingdom to Thailand, representatives from Australia and New Zealand, the US, more than 300 soldiers from the United Kingdom and others from Commonwealth countries. A pipe band made up of Irish Guards performed as part of the ceremony and was followed by a Christian prayer ceremony. 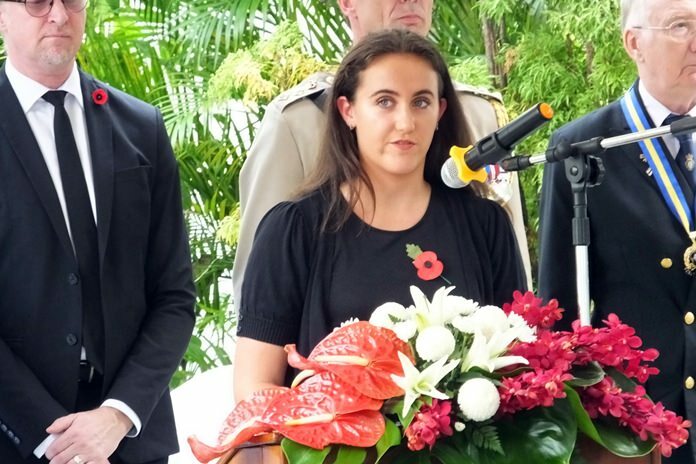 Honor Cuckson, representing the future generations who will remember, reads the words of the Kohima Epitaph. 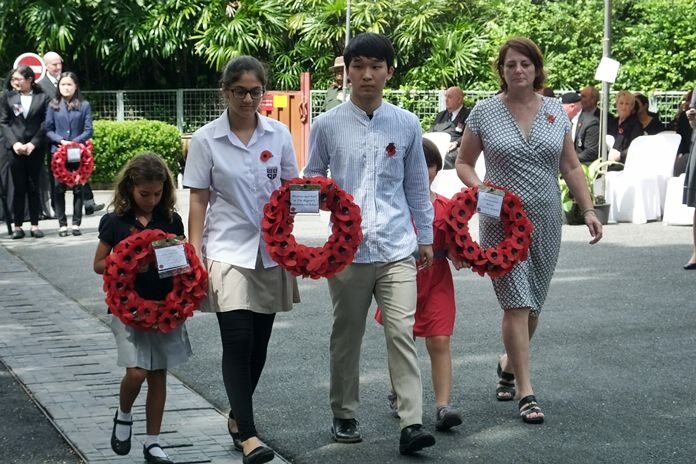 Many people attended of all nationalities including children from international schools, expatriates and residents in general who joined to lay wreaths at the War Cemetery to mourn the passing of the soldiers. 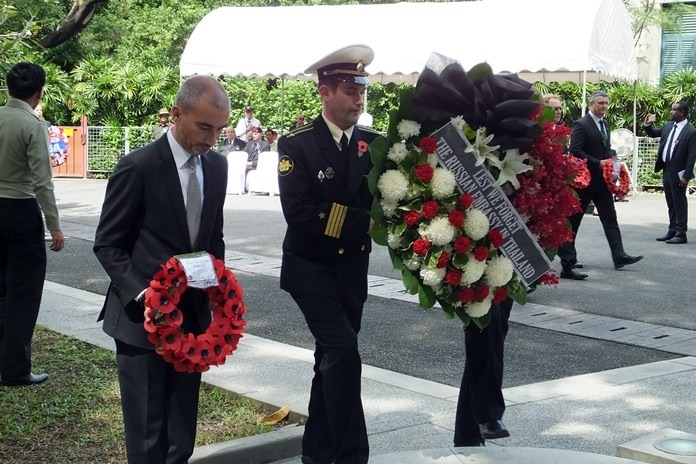 The following day was an early start from Kanchanaburi to Bangkok to the British Embassy for Service of Remembrance that was conducted by the Reverend, Timothy Eady. 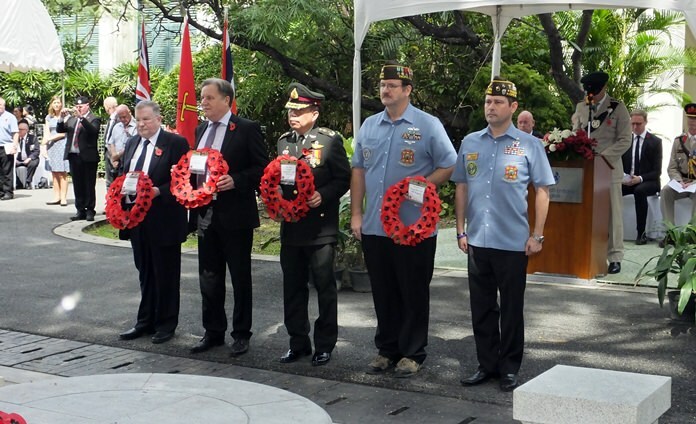 The Royal British Legion Standard was led on by the multi-national pipes and drums courtesy of the British Club Bangkok. 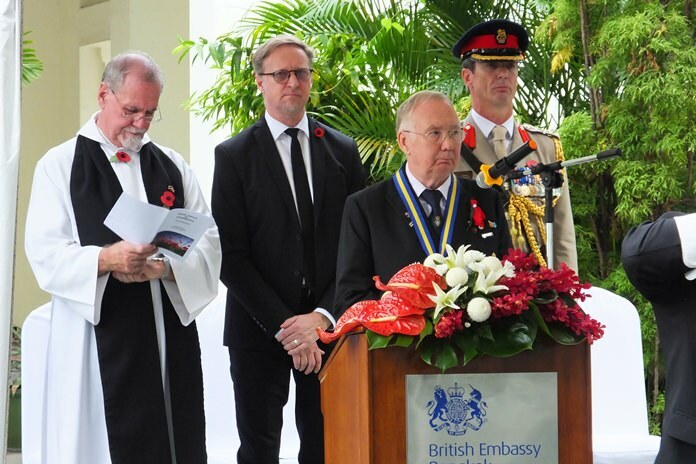 The British Ambassador did the reading from Matthew Chapter 6, Andy Barraclough read the Act of Remembrance, Honor Cuckson read the words of the Kohima Epitaph, Colonel Roger Lewis read Psalm 23 while ‘The Lord is my Shepherd – the Final Hymn was performed by the Shrewsbury School Choir. Meanwhile, November 12 – In the UK, HRH the Prince of Wales laid a wreath on behalf of Her Majesty the Queen, who observed proceedings from a balcony at the Foreign Office. The beginning of the Two Minute Silence was marked by a two-gun salute fired on Horse Guards Parade. Following the silence, HRH the Prince of Wales paid his respects to the fallen of the United Kingdom’s Armed Forces by laying HM the Queen’s wreath on the Cenotaph. 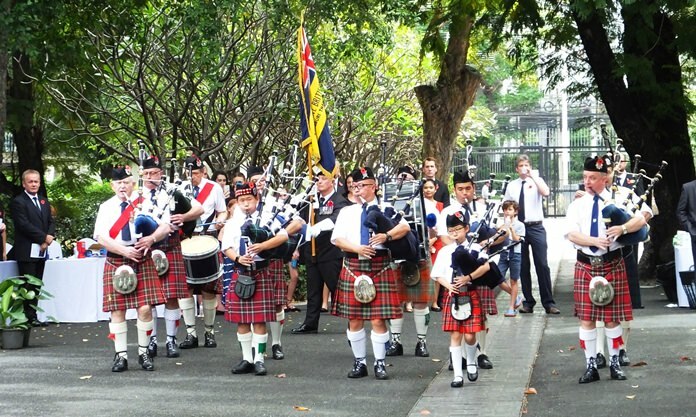 The Pipes & Drums of the British Club Bangkok. Other members of the Royal Family followed, including Their Royal Highnesses the Duke of Cambridge and Prince Henry of Wales. After the service, thousands of Veterans marched past the Cenotaph to pay their respects. Veterans from hundreds of associations came from all over the world to pay tribute to the fallen. 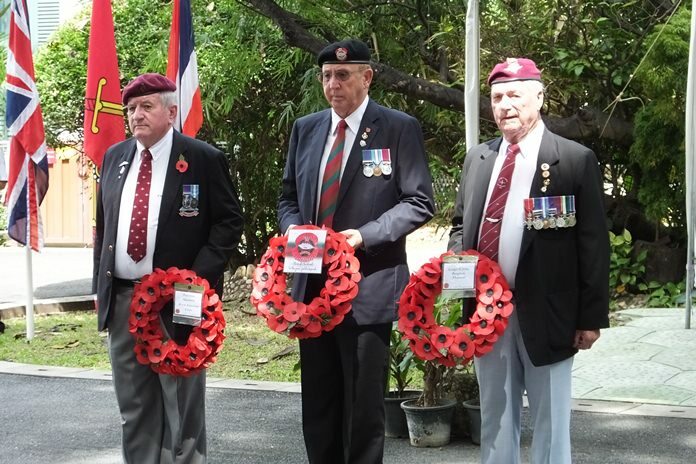 The Royal British Legion Chonburi provides financial, social and emotional care and support to all members of the British Armed Forces – past and present and their families. The Legion is also the national Custodian of Remembrance and safeguards the Military Covenant between the nation and its Armed Forces and is best known for the annual Poppy Appeal and its emblem the red poppy. 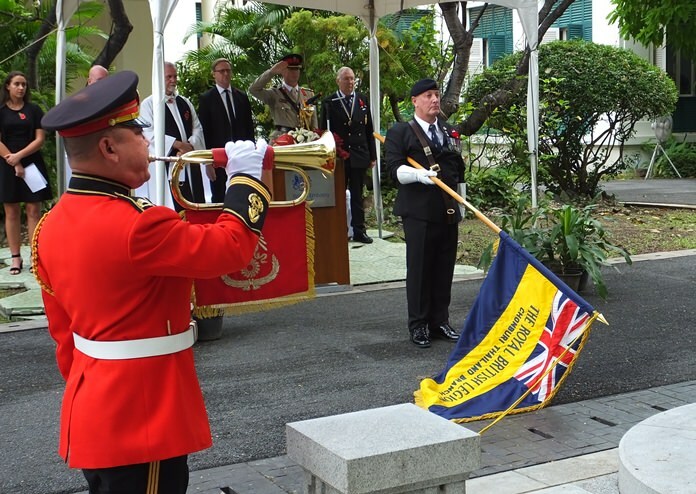 Richard Holmes, the RBL Thailand Standard Bearer, lowering the Legion Standard during the Last Post. 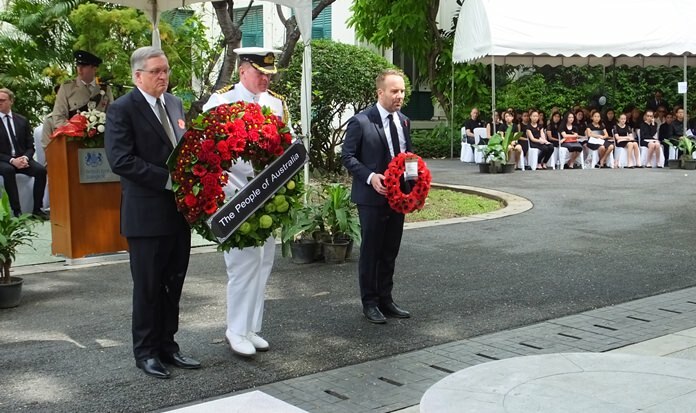 Wreaths were laid by (L to R) Defence Attaché Colonel Roger Lewis, British Legion President Graham Macdonald, and British Ambassador H.E. Brian Davidson. Representatives of the British Women’s Group & Chula Masonic Lodge 9743. Australian ambassador H.E. Paul Robilliard (left) with the Australian defence attaché. RBL Secretary Bert Elson (left) and WWII veteran Archie Dunlop (behind), the Legion’s oldest member at 95. 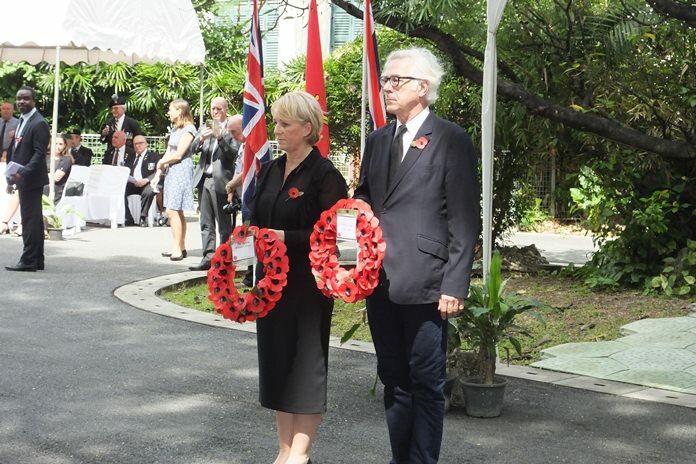 Defence Attaché Colonel Roger Lewis, British Ambassador H.E. 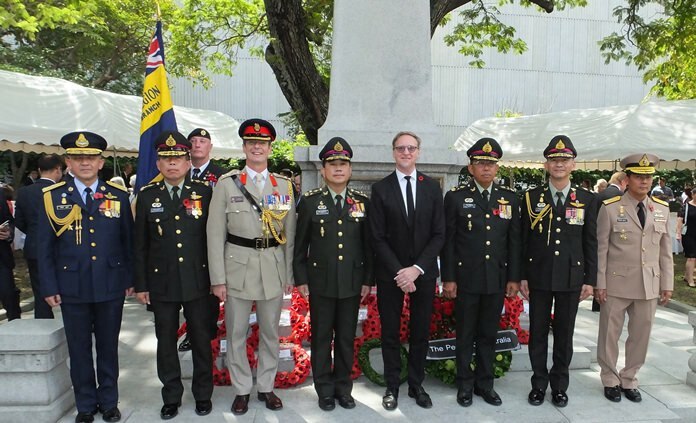 Brian Davidson with dignitaries from the Royal Thai Military. 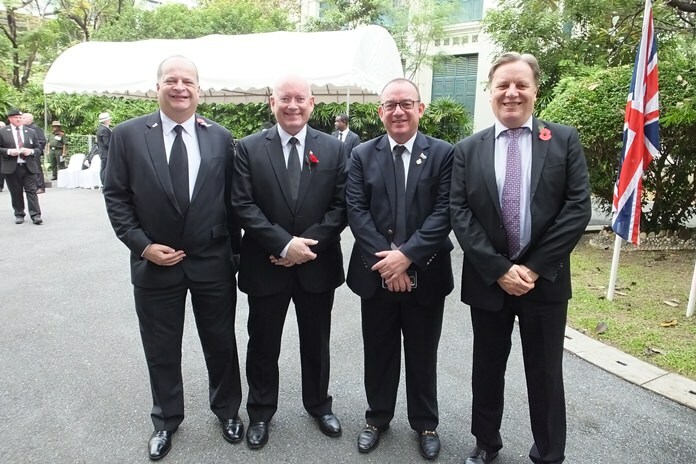 The British Chamber of Commerce Thailand was represented by (L to R) Greg Watkins, Graham Macdonald, Mark Bowling and Simon Matthews. 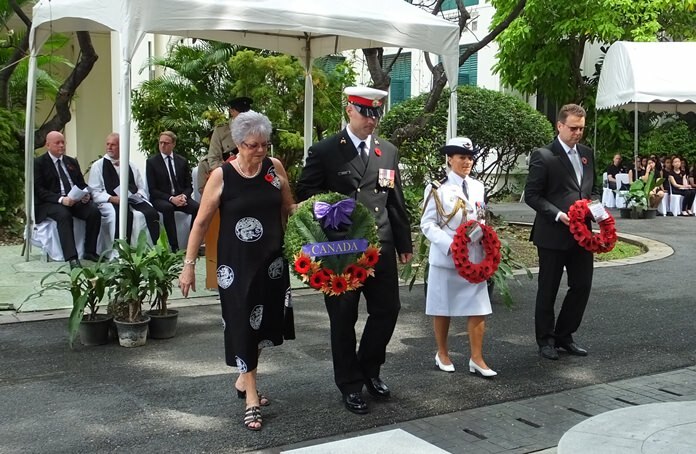 Members of the Canada Embassy present a heartfelt wreath. Representatives or the Portugal Embassy and Russian Embassy. 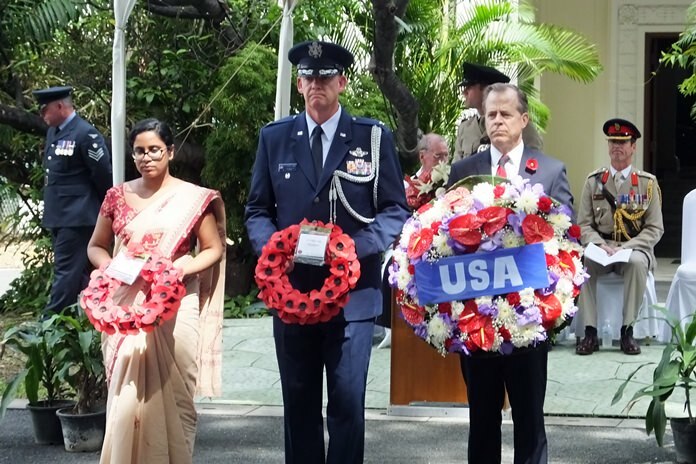 A representative of the Indian Embassy, and the USA Ambassador H.E. Glyn T Davies, with defence attaché. (L to R) Timothy Walton, John Hocking and Middy Campbell. 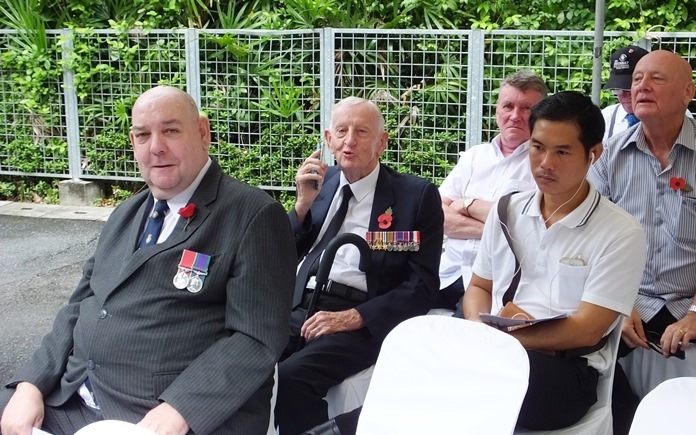 Members of the British Club Bangkok (left) and War Veterans Association (right). Students and teacher from Regent International School and St Andrews International School. (L to R) RBL members Robert Mann, Mrs Mann, Iain Cousins and Marty Neill.